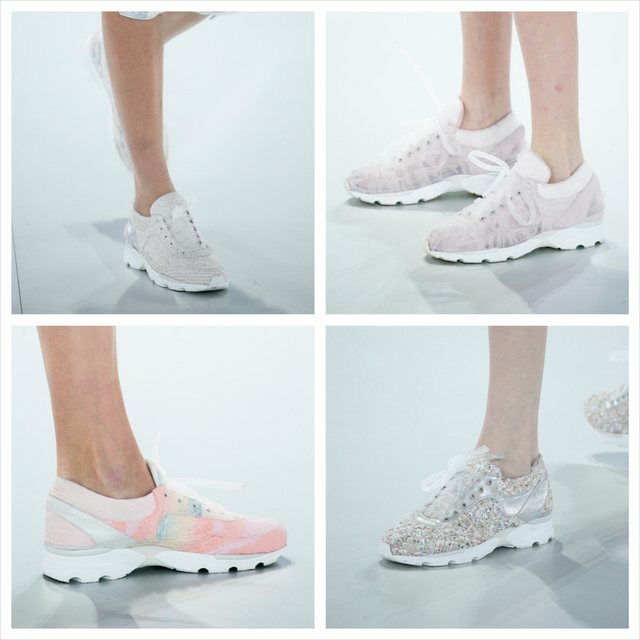 After making a surprise appearance on Parisian catwalks last month, Chanel’s haute couture running shoes emerged as the most viral story from the Haute Couture Spring 2014 fashion week. Many a fashionista’s eyes rolled at the esteemed French house, as if to say that streetwear influences in haute couture are blasphemous and inelegant. How do running shoes align with the ethos of haute couture and Chanel itself? Haute couture is a secretive and sequestered business with estimated 4,000 or fewer clients worldwide; price tags start at £30,000 for gowns. While commoners shell out £80 for a pair of Nikes, Chanel’s sneakers, handmade by Parisian luxury footwear atelier Massaro and taking more than 30 hours to complete, will cost €3,000 and up. Fashionable running shoes have become ubiquitous because they answer the needs of the contemporary woman leading a busy and active life in a big city, taking the tube to work, shopping during lunchtime and hitting the gym in the evening — try doing these things in five-inch stilettoes. A typical haute couture client is an ostentatiously rich woman who spends hundreds of thousands of pounds per season on clothes, employs others to do errands for her, uses a chauffeured car for transport, and easily lives in five-inch stilettoes. She only needs running shoes for actual sports. And wouldn’t she rather buy them at Chanel than Nike? I’m surprised that Chanel and Dior were the only fashion houses to have come up with this idea. At Chanel, the sneakers nod cleverly to a key moment in the house’s history. In 1913, Coco Chanel and her lover Arthur Boy Capel, as well as many members of the French high society, withdrew from Paris to Deauville, a seaside resort in Normandy, to escape the war. The sartorial situation in Deauville was critical: the jet-set would rather be caught dead than in old clothes, but there were no dressmakers. Even worse, their clothes were too fussy for a laid-back resort town. Coco Chanel seized the opportunity and opened a boutique selling sportswear. With the war calling for a pared-down, practical look and rejecting extravagance, the style quickly caught on. Unlike the classic Chanel suit, which has remained the same since the 1950s, the haute couture running shoes are rehashed in a perfectly contemporary manner while referencing the very beginnings of Chanel. If you believe that they don’t deserve a place on the catwalk, fashion is moving faster than you. Even though I love the patterns and colour combinations (Chanel is my favourite designer after all), I find the shape of the sneaker really odd. Vaguely reminds me of foot binding. I much prefer my vintage Nike's to be perfectly honest, which is just as well, because I don't feel comfortable with the Haute Couture prices now that the wage gap is criminally large. Foot binding was exactly what I thought about the Dior sneakers, and is the reason why I haven't posted any photos of them here. They look really uncomfortable and unsporty, though the embroidery seems lovely. I wonder how they even came up with that shape in the first place. I don't have very broad feet, but I'd need more room for my toes, for sure. Do you know anyone who tried them on their feet? Maybe we are missing something here. Hm, I am not sure I get this trend... Training shoes evoke a firm association with the gym and I just cannot think of them as anything else than a workout necessity. We are used to wear sneakers (especially this type) to the gym or any sport activity in general, but not paired with pants or even suits. But, I tell you, sneakers have creeped into my life and became a vital part of my go to work footwear. Yes, I wear neon pink Nikes with my black suit and white shirt outfit to work. I do change into heels in the office but only because I need to (dress code and stuff). And although I use sneakers in this term to be most comfortable as I can be, since I am always on the run, I would without any doubt buy Chanel sneakers - not for the gym, not for to work walks or running erands, but because I find them beautiful and I think they would incorporate great in my style in any occassion possible (OK, not with ball gowns, but you see my point). I think I would wear them as much as possible, as I do any item I really like, and I try to work my style around it and build an expression of how I truly feel this piece. But on the other hand, there is no way I would wear something popular and so trendy no matter if whole world is wearing it - if i don`t like it. No matter how practical or cool or whaterver it is. Like JC Litas. Hoofs if you ask me. And I totaly agree with you Eva that running shoes are almost natural way to go for Chanel and that there is a connection in the story. I believe that they are good in listening of the world and what is going on and how people are breathing in matters of trends and needs.